I'm Susan Lindauer, and I want to thank everybody for their concern about the abuse that I have suffered from the Bush Administration. Mike has done an outstanding job in articulating my case, paying careful attention to specific details at all times. By contrast, the New York Times pulled a Judith Miller on me. They actually reported that I stuck out my tongue at the Prosecutor, which I categorically deny. I was shocked when I read it. The NYT reporter could not even see my face, yet he made up a point for his story strictly for the purpose of dissing my push for a trial. He reported nothing about my predictions about an attack involving airplanes anad the World Trade Center in the summer of 2001. One would think NYT readers would be quite interested in that testimony. Bottom line: thank god for the blogs! Without you guys, nobody would know anything that's really going on! (June 17, NYC). A surprise development occurred at today's hearing in the case of Susan Lindauer versus the United States. 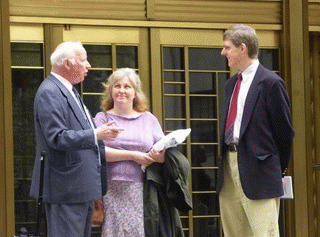 A long time associate of the accused, associate professor of computer science at Toronto's York University, Parke Godfrey, Ph.D., testified that Susan Lindauer predicted an attack on the United States in the southern part of Manhattan. According to his testimony, she said that the attack would be very similar to the 1993 bombing of the World Trade Center. Godfrey said that Lindauer made the prediction on several occasions, one as late as August 2001. The testimony occurred in a hearing on Lindauer's competence to stand trial held before U.S. District Court Judge Loretta Preska, Southern District of New York, in lower Manhattan. On March 11, 2004, Lindauer was arrested for acting as an "unregistered agent" for the nation of Iraq prior to the U.S. invasion. Prosecutors have delayed the trial for over four years claiming Lindauer was delusional for asserting that she was a U.S. intelligence asset over a period of nine years, including the period covered by the indictment. This was Lindauer's first real opportunity to argue her competence to stand trial and deny the delusions claimed by court psychiatrists. Lindauer asserts that she had been a U.S. intelligence asset since working on the Lockerbie case and subsequent antiterrorism efforts. Appearing for the defense, Dr. Godfrey testified under oath that Lindauer told him of her specific concerns about an attack on the United States. She told him that a "massive" attack would occur in the southern part of Manhattan, involving airplanes and possibly a nuclear weapon. The witness said that she mentioned this in the year 2000, which coincided with the Lockerbie trial. And then in 2001, Lindauer mentioned the anticipated attack in the spring, 2001 and then August 2001. Godfrey said, at that time, Lindauer thought an attack was "imminent" and that it would complete what was started in the 1993 bombing (the original World Trade Center bombing). After the hearing, Lindauer elaborated that this extreme threat scenario was done in concert with the man she says was one of her CIA handler, Dr. Richard Fuisz, who has been associated with U.S. intelligence. Federal prosecutor Edward O'Callaghan tried to diminish the prediction by asking Godfrey if Lindauer presented this a "prophesy". Godfrey denied hearing that word mentioned in their conversations. He stated that Lindauer used the term "premonition." The prosecution did not challenge Godfrey's testimony that Lindauer made the predictions in the time period given by the witness. After the hearing, Lindauer said that she'd called the Department of Justice Office of Counterterrorism in August of 2001 reporting her fears about an attack. September 11, 2001 attack where the former World Trade Center towers once stood.